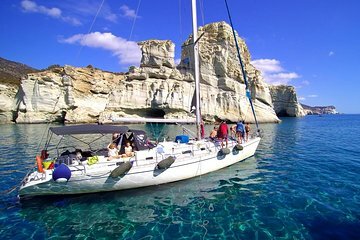 The best way to view Milos’ coastline is undoubtedly from the water, especially when you’re cruising on a luxury catamaran. Opt for an activity-packed experience of the Greek island on a sailing tour that includes a snorkel safari; breakfast, lunch, afternoon tea, and snacks; and multiple swimming stops at spots hand-picked by your guide. This experience is ideal for families.